Fisheries—the capture or rearing and processing of marine species—were integral to the development of coastal Maine’s economy and culture. Europeans were drawn to settle the North American continent because of cod, a groundfish once abundant in local waters. Early settlers learned some of their fishing techniques from the native Waponaki people, including how to construct and operate herring weirs. For centuries, fishing influenced settlement patterns, putting Maine on the global map as a purveyor of seafood for European Catholic countries, the slave trade, and local people who relied on the bounty of the sea. Clams, menhaden, mackerel, herring, alewives, and many more species were harvested for local consumption or else were used as bait for Maine fishermen headed offshore to faraway fishing grounds like Georges Bank and the Grand Banks of Newfoundland. Some 75 canneries processed herring for the global marketplace until 2010, when the last of Maine’s sardine factories closed. Lobstermen still rely on herring for bait. The lobster fishery grew steadily since first expanding in the late 1800s, and today is the number one marine resource industry in Maine in terms of both pounds landed and value. 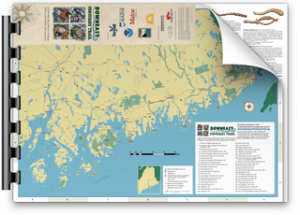 In the coming months, more information and resources will be added here about the rich fisheries heritage of Downeast Maine, including historical images and film, oral histories, and accounts of how fisheries have influenced a way of life in Maine for centuries.